Yes, today was the first day that you could dispose of your Christmas tree, but if you didn’t get all the decorations off yesterday after a Winter Classic hangover that had you asleep on the couch, don’t fret, you’ve still got time. Trees need to be stripped of all their ornaments and lights, but you can just take them to the treeboxes on your street any time between now and January 15th and DPW will swing through and pick up the trees and turn them into tasty mulch for your garden. Don’t bag the trees and wreaths, though, as that will interfere with the process. Just leave the naked tree and branches out in your tree box any day between now and January 15th. 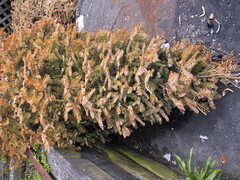 Don’t be surprised, though, if your tree isn’t picked up the next day, though, as the windows are general, it could take a day or so for your tree to be picked up. If you’re still rocking the tree come January 16th, that’s fine, you can still dispose of it on trash day depending on availability in the trash trucks. If you’re in the District, a treebox is the planter area around one of the city trees on your street. I feel bad for the guys who pick these things up…my dog is having a field day, peeing on every discarded Christmas tree up and down my street. What if I don’t have a tree box. Can I just put it in the grass by the road?